Other than meditation, what practices help you to be mindful? Whether specifically looking for information on wellness or just perusing social media in the last few years, you've probably come across the word mindfulness. It seems to be everywhere now. Maybe you have a meditation practice that you started because of a yoga class or through an app like Headspace. For a long time, I equated mindfulness and meditation as many people do. Until this book. 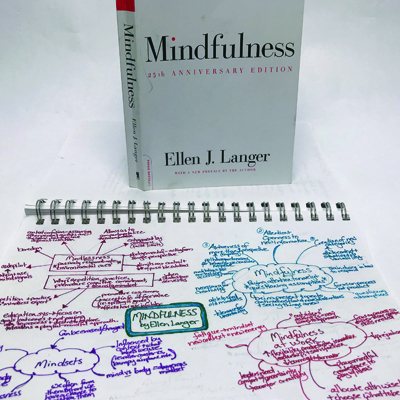 A few years ago, I heard an interview with the author Ellen Langer marking the release of the 25th anniversary edition of Mindfulness. Most of what she said resonated with me, but I knew I needed to get the book when she explained that meditation provides one of the many doorways to being mindful. I have meditated, I know the research to support the benefits of meditation, and I know lots of people that enjoy a regular practice. But it turns out that over the years, I have developed several other ways to engage in mindfulness that feel more natural to me - meditation not required. More on that later. Langer acknowledges early in the book that she approaches mindfulness from a Western scientific perspective. Her research originally focused on mindlessness which is how she begins the book. Although she doesn't feel well versed enough to do it, she welcomes others to make comparisons between what her research has revealed and Eastern teachings on mindfulness. I'm not able to do that either, but I will look at a few themes from her research that I found interesting and/or challenging. 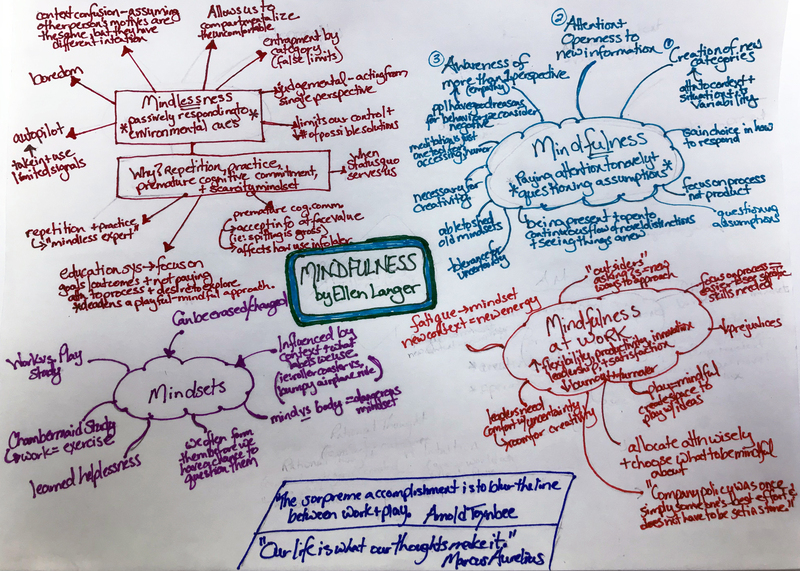 Mindlessness & Mindfulness: In the preface to this edition of the book, Langer states, "Mindlessness is pervasive. In fact, I believe virtually all of our problems - personal, interpersonal, professional, and societal - either directly or indirectly stem from mindlessness." That's a strong statement, but in our current era of smart phones and social media, it may explain why this topic has become more prevalent. Although I can see where mindlessness causes problems, I can also think of times where mindlessness has served me. For example, sometimes when I go for a walk or run I am very mindful of my body and the environment around me. Other times I finish having forgotten most of the run because my mind wandered. But during that mindlessness, I managed to solve a problem or have an idea for a new program. The same can happen when we commute, grocery shop, or any number of a variety of autopilot type tasks. Langer addresses this when she talks about "second-order mindfulness" when we choose where we pay attention. I guess that means if I just zone out on a run because I'm tired then that's mindless, but if I choose to be mindless about the physical act of running so that I can let my mind focus on solving a problem it's mindful. 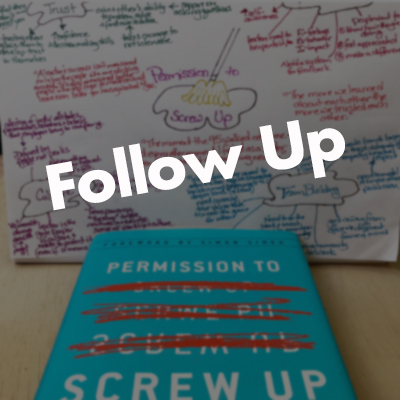 I'm still wrestling with this idea and will have to observe when I'm on autopilot and whether I'm making a conscious choice to do so. Process before Product: Yes, yes, yes! We emphasize process in all of our juggling and skill toy workshops. Focusing on the end result prevented me from learning how to juggle and created a lot of stress for me along the way. It wasn't until I let go of the goal of "being good at _____________" (you can fill in your own goal here) that I could shift attention to mastering the discrete skills and steps to get there. And guess what happened to the stress I had been feeling? The pressure dissipated. I had fun with the process and many moments of minor success along the way. Langer claims that the focus of schools on outcomes and goals creates "an anxious preoccupation with success or failure rather than drawing on the child's natural exuberant desire to explore." This effect isn't limited to kids though. Paying attention to process also allows companies to innovate and adapt as new information presents itself. Having one goal and only one goal in mind leads to more rigid thinking and less openness to new ideas. It gets messy along the way, but she identifies comfort with uncertainty as a quality of mindfulness. 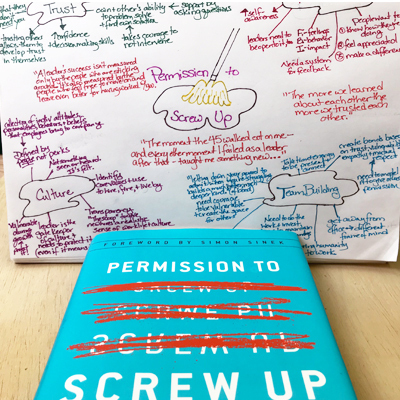 I still wrestle with embracing the messy process of learning something new and the uncertainty that goes with it, but exercising self-compassion, focusing on the process, and being willing to laugh at myself helped me as well as the thousands of jugglers we have taught over the years. Context Confusion: This frequent problem plays a huge role in social interactions and team dynamics. A context according to Langer "depends on who we are today, who we were yesterday, and from which view we see things." 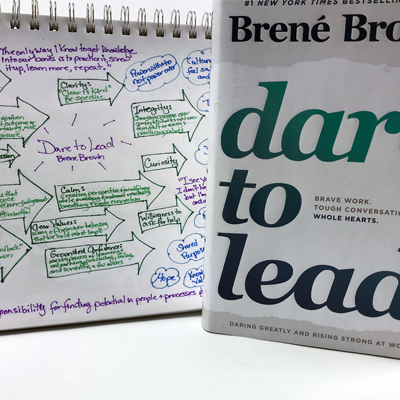 Her ideas overlap with Carol Dweck's research on mindset. Context, just like mindset, affects how we respond to situations and mindlessness can lead to context confusion. When this happens, we make assumptions about other people's motives and intentions because we think they're operating from the same context as us. This has happened often on our two person team especially when we're working under a deadline or under some other "stress." I know I have gone into meetings with assumptions about how we're moving ahead with a project based on previous conversations and my context for how to do it best, but it differs from Paul's. Or I'll be way off base about his motivation behind the comments or questions he offers. The friction that results can last and impact the quality of our work. Practices we've developed to be more mindful include setting intentions at the beginning of meetings and asking questions about the intention of the other person if one of us starts to feel tension because often times that's enough to clear up the context confusion that has occurred. It takes time and energy, but conflicts and the associated negativity seem to take even more. - Photography: Looking through the viewfinder helps me see the world around me differently. Posting phone camera shots to Instagram has challenged me to think about how to capture our business in simple square images. When I create the graphics featured in our gallery that combine my photos with motivational quotes, I have to look with fresh eyes: where will the words fit within the image? how should they be arranged? which words do I want to emphasize? - Curiosity: When I notice tension in my body or in reaction to someone else, I get curious. Still a work in progress, but when I ask direct questions without emotion or judgment of myself or others, the discomfort usually gets resolved before it turns to conflict. - Playfulness: Whether I'm writing for our blog, creating new programming, or even doing data entry, I try to find something playful in it. If I find myself procrastinating or a sense of dread coming on, I try to find a way to make it fun. Sometimes it's easy to do. But when it's not, it helps to step back and look at the bigger picture and why we do the work we do. Focusing on process instead of end result helps, too. - Gratitude: There's a lot already written on gratitude practices so I won't spend much time on it. I will share that we've had cars packed full of performance/workshop materials break down far from home - once in a snow storm on the Cross-Bronx Expressway! In all of those situations, Paul & I both go into gratitude mode - thank goodness we don't have to be at a gig today and good thing this happened while it's still light out. The stress levels drop and we're better able to be mindful about next steps to address the situation. What other practices help you to be mindful in times of uncertainty and stress?